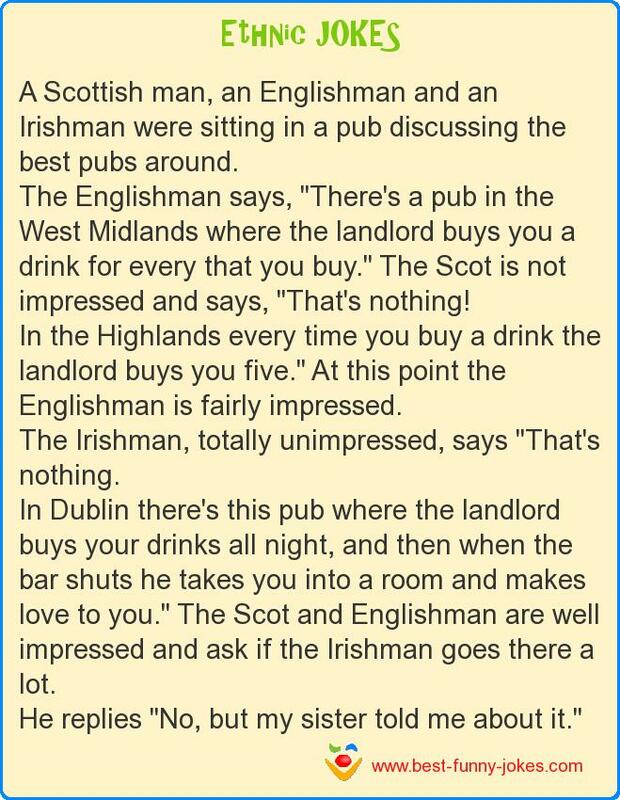 A Scottish man, an Englishman and an Irishman were sitting in a pub discussing the best pubs around. The Englishman says, ''There's a pub in the West Midlands where the landlord buys you a drink for every that you buy.'' The Scot is not impressed and says, ''That's nothing! In the Highlands every time you buy a drink the landlord buys you five.'' At this point the Englishman is fairly impressed. The Irishman, totally unimpressed, says ''That's nothing. In Dublin there's this pub where the landlord buys your drinks all night, and then when the bar shuts he takes you into a room and makes love to you.'' The Scot and Englishman are well impressed and ask if the Irishman goes there a lot.